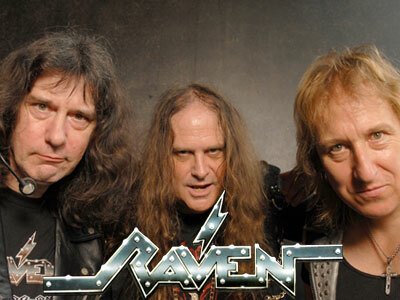 New wave of British heavy metal and thrash legends RAVEN are embarking on a US and Canadian tour which will coincide with the release of their Documentary DVD entitled Rock Until You Drop - A Long Day's Journey documents the band's almost 40 year career and highlights their high energy approach and influence on the development of thrash. The DVD will be released July 16th via Steamhammer/SPV in North America and can be pre-ordered here. Joining them on the tour will be Special Guests and long time friends - Mpire of Evil which features ex Venom members Tony Dolan (Demolition Man) and Jeff Dunn (Mantas) together with drummer JXN Jackson marking their return to the US and Canada in support of their brand new album Crucified (Cleopatra Records) out now in North America. The tour will start in Fort Lauderdale September 11th and end in Chicago On October 1st. RAVEN will then continue on as double headliners on the Diamond Head tour which will hit the West Coast in October.